Ephemeral messaging app Slingshot — Facebook’s (s FB) latest attempt to take on Snapchat — has been largely forgotten by the masses less than two months after launching. Its novel features that distinguish it from Snapchat, like mass contact messaging and faster picture sending, have not been enough to keep it at the top of the iOS app store. Although Facebook is showing it can keep its users around its core experience and monetize them to the moon, it has struggled with predicting new markets, staying ahead of the social trend curve the way Apple did with music and tablets. It continues to be a few steps behind. Although that’s not a revenue problem today, it certainly could be in the future if new entrants steal eyeballs away from it. So Slingshot isn’t just a casual messaging app. It’s Facebook’s most recent effort to invent, and its performance will be watched closely for exactly that reason. Based on download data from market research companies, Slingshot’s app store ranking peaked at #70 during its buzzy launch covered by the likes of CNN and The Guardian. It has steadily declined ever since, dipping below #1,000 in overall U.S. app downloads, according to App Annie chart analytics. App Annie stops tracking the rank once an app falls out of the top 1,500 downloads. After July 3rd, Slingshot disappears. 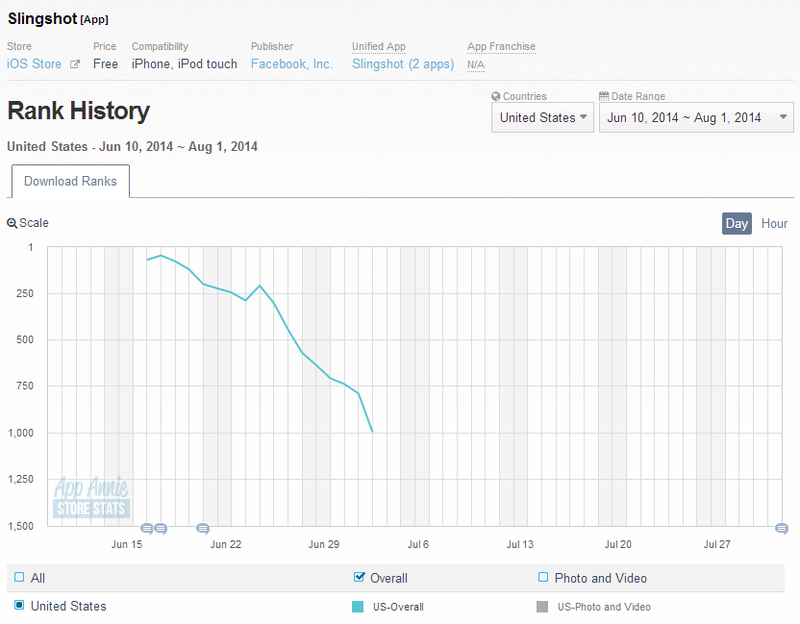 Slingshot on iOS – first two months after launching (June 10, 2014 – Aug. 1). App Annie stops tracking the rank once the app falls out of the top 1,500 downloads. After July 3rd, Slingshot disappears. Such a dramatic drop-off can occur when a lagging app is booted out of the top rankings by new, more popular app entrants. Slingshot’s trajectory looks a lot like that of Facebook’s last big effort to compete with Snapchat – Poke. 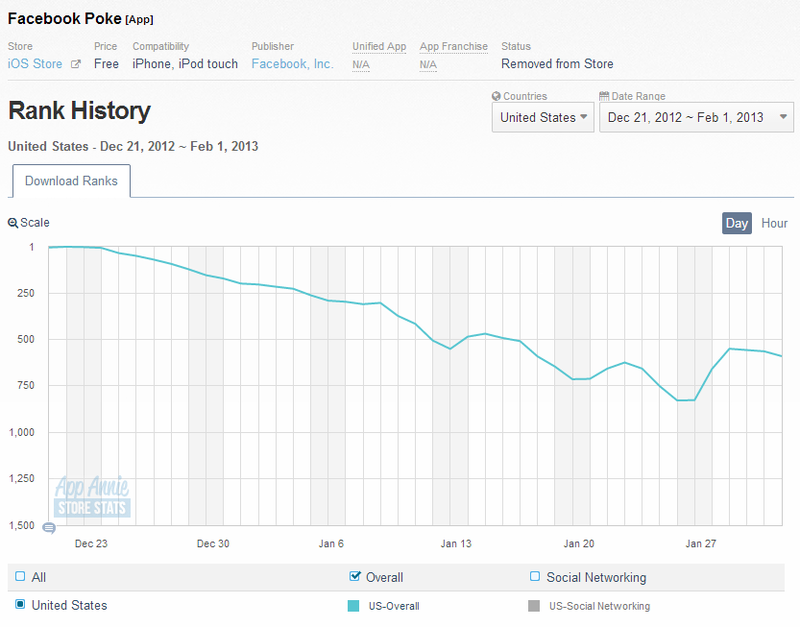 According to data I pulled from App Annie, Poke’s app ranking in its first two months is nearly parallel to Slingshot. Both launched to great fanfare and appeared in the top 100 overall app downloads in the first day of release. Then, both dropped below the 750 mark in overall app downloads. 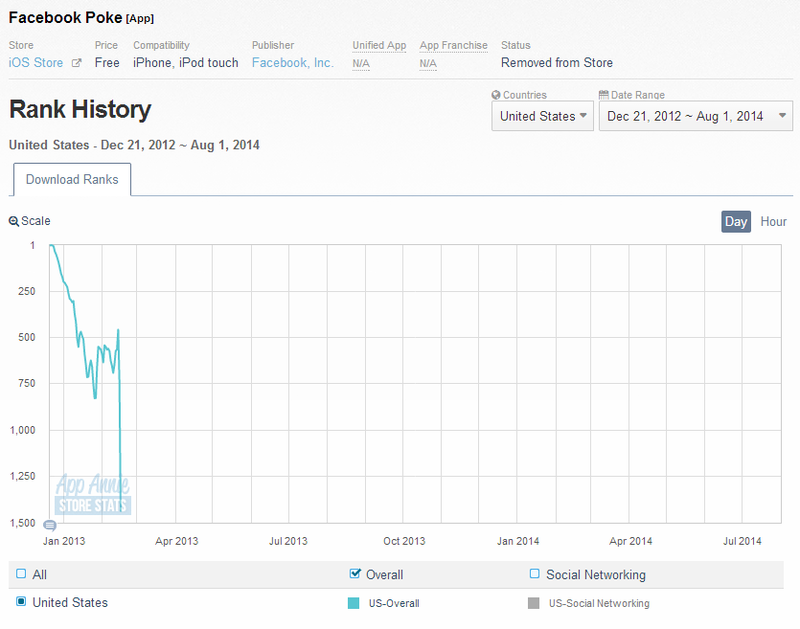 Poke – rather infamously – continued to plummet down the charts until finally Facebook removed it from the app store altogether in May 2014. 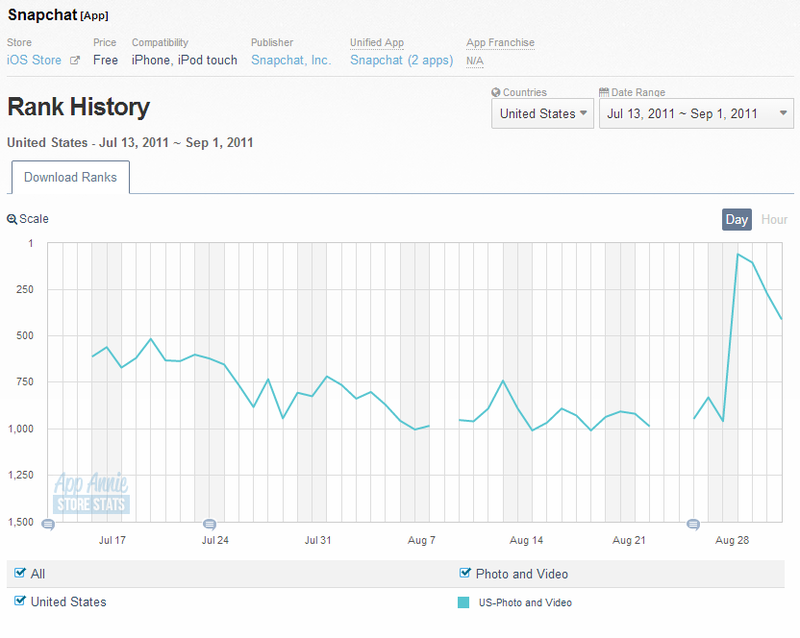 By comparison, Snapchat had a less exciting app store launch ranking than Slingshot or Poke. 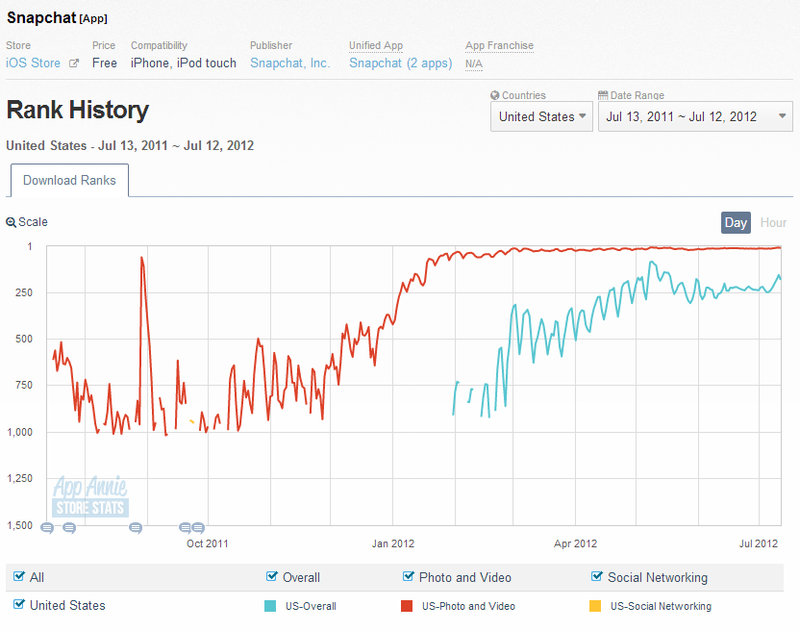 As you might expect from a (then) unknown app without the Facebook brand name, it didn’t initially crack the top #100. Instead, it stagnated around the #850 mark. But towards the end of its first two months it started to rise through the ranks. Within a year, its trajectory was decidedly upwards sloping. Once tech companies grow to a certain size, they often find it challenging to continue pushing product boundaries, attracting new users, and inventing creative tools that the masses want. We’ve certainly seen a huge swath of tech companies reach critical mass and slowly decrease in terms of relevance and consumer excitement: Even Facebook rival Twitter has had to overhaul its product development strategy and executives over the past year. Poke was Facebook’s first effort to combat the Snapchat threat – a blatant ripoff described as a “Snapchat clone.” When that didn’t inspire the masses, Zuckerberg tried to buy Snapchat for a reported $3 billion and failed. Slingshot is the company’s latest attempt to crack into the ephemeral messaging space, although this time it added new features not already popularized by Snapchat. There’s a tap-and-release sending method that strips all extra steps from the picture taking process. Users have to send a selfie to see a selfie sent to them. These small adjustments that lead to a big difference in user experience. It’s worth noting that the product comes from a very different place in Facebook’s development team than Poke did. Whereas Poke was a half-baked effort spawned from a hackathon, Slingshot came out of Facebook’s Creative Labs. That’s the fancy term for the company policy that allows employees to break into small teams and experiment with building products that aren’t part of the main social network. It’s part of Facebook’s movement towards unbundling individual apps for standalone features, versus one app to rule them all. If Slingshot does well, it will be a sign that Facebook is learning to predict what’s hot before it happens. But at the moment, its downward slope of downloads doesn’t look too promising.